There isn't a bigger brand in the BMW Motorrad pavilion than the GS, or to be specific, the R 1200 GS. 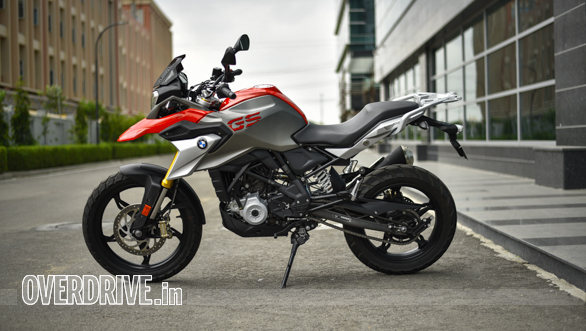 And the G 310 GS, now, is the first time that Munich has created a GS-branded motorcycle that displaces less than 500cc. 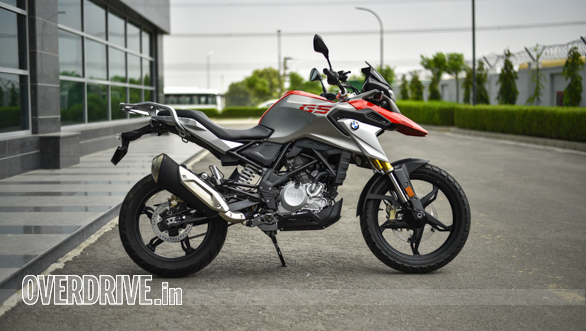 The BMW G 310 GS, of course, comes from the same platform as the TVS Apache RR 310 and the other BMW motorcycle, the G 310 R. But the format of the BMW G 310 GS talks to the same idea as the R 1200 GS - a competent touring motorcycle with more than a modicum of off-road ability. And that's built on the foundation of quality and reliability that the GS is famous for. The Indian adventure tourer market is just getting going. It starts today at the Rs 1.8 lakh Royal Enfield Himalayan and goes up to the Rs 4.6 lakh Kawasaki Versys X-300. 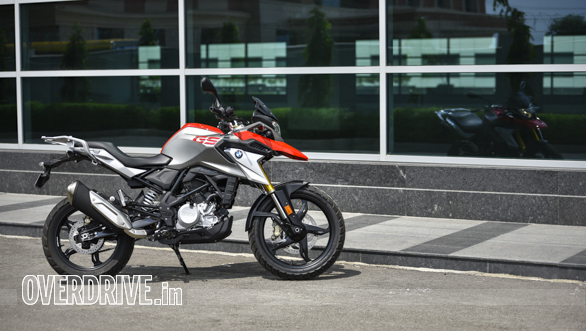 The BMW G 310 GS is the third adv at Rs 3.49 lakh ex-showroom. The Hero X-Pulse, at a price just under Rs 1 lakh should arrive before 2018 becomes history and of course, KTM has confirmed that 2019 will bring the 390 Adventure to India and the world. Keywords loaded, let us dive straight into the motorcycle. The trellis frame and the swingarm are exactly the same as the G 310 R. The engine is exactly the same as well, down to the gearing. That means the 34PS/28Nm 4-valve DOHC single cylinder is mounted 'backwards' and tilted back slightly as well. 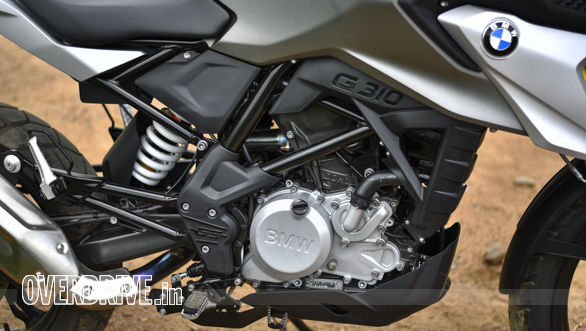 The engine of the BMW G 310 GS is pretty smooth for the most part and performance is modest but delivered easily. Now come the differences. First, the front suspension is taller, offering 180mm of travel, versus 140mm on the 310 R. The rear has the same amount of travel (131mm for the R). Both suspension units are longer and that's how the G 310 GS sits taller, offers more ground clearance and has a 835mm seat height. Mounted to this suspension are the same brakes, ABS is standard but on the GS, you can turn the rear ABS off for off-road work if you want to via a prominent switch on the left cluster. But the wheels and tyres are completely different. The rims are a similar design but the BMW G 310 GS wears a 110/70R19 and 150/70R17 Metzeler Tourance pair. That's a tall tyre with big-block tread that promises a blend of 80:20 on- and off-road ability. That's not all. The GS has slightly less trail but a bigger rake and uses a forward offset axle. This gives it more stability, and a longer wheelbase which should help when you've got luggage or pillion, or both, on the bike. The BMW G 310 GS is an artful mini-replica of the R 1200 GS from the pointy beak to the way the rear rack and the body panel below it looks. That package is wrapped up in wonderful bodywork. 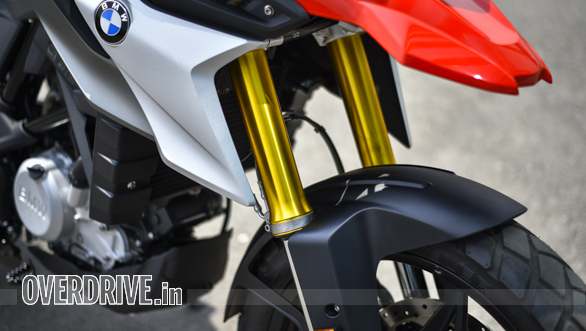 Clearly inspired by that R 1200 GS, the look starts with a functional lower mudguard topped by a GS-correct beak that extends from the headlight (shared with the G 310 R). 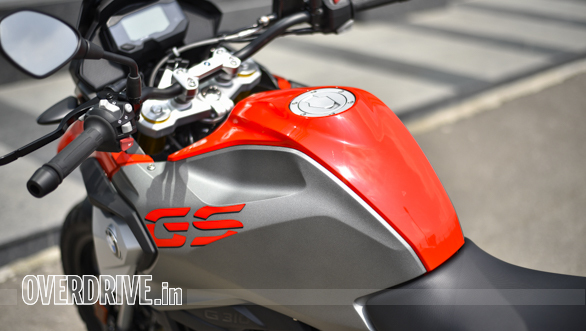 The short screen completes a look that is clearly BMW and clearly a part of the GS family. Behind that fairing is the same digital instrument cluster as the R and the ABS indication will flash to remind you that you've turned off rear ABS. The tank is still an 11 litre unit - a small surprise, we were expecting a slightly larger tank for the GS - but it's a big, wide unit that completes the look and is proportionate. Just like the GS, there isn't much more bodywork past this point and the motorcycle ends in a substantial rack that will prove very handy for those of us planning to head out on to the highway. Unfortunately, all this bodywork and bigger suspension does have an impact on the weight - the BMW G 310 GS is 11kg heavier than the 310 R.
The additional weight does have a pro and a con. 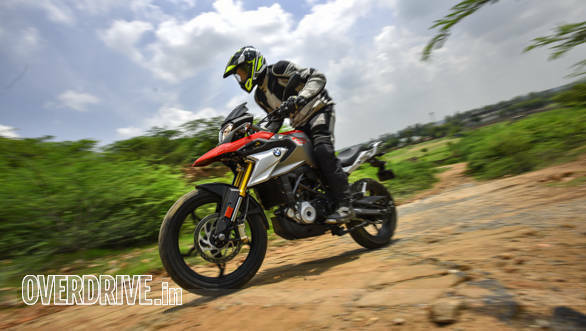 The con, naturally, is that the BMW G 310 GS feels a bit slower and less urgent than the G 310 R. Top speed is identical according to the BMW - 143kmph. 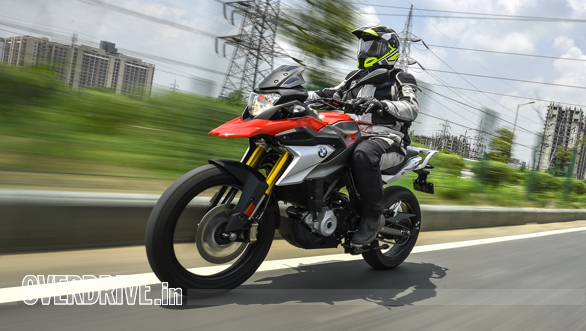 The advantage though is that the GS feels more comfortable, less strained and more like the R 1200 GS in nature. 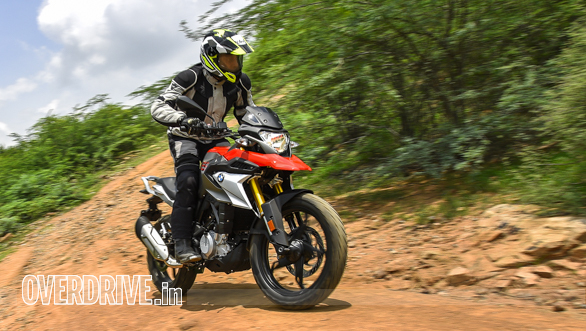 The BMW G 310 GS feels good to ride in a composed, controlled way not unlike the R 1200 GS. Let me explain that. The surprise for me when you ride the 125PS/125Nm R 1200 GS is always how calm, and understated the nature of the performance is. 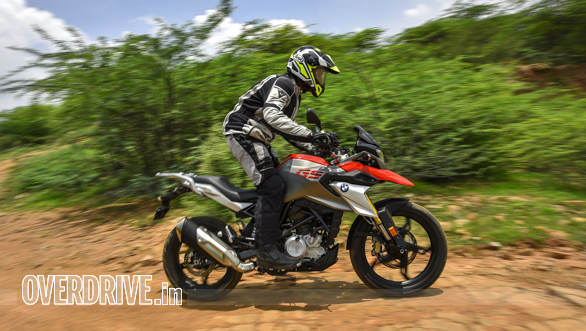 And while the G 310 R feels more exuberant, the G 310 GS feels quieter and more composed. I suspect that 10 hours into a long ride, the latter will feel better. The BMW G 310 GS does miss, visually at least, spoked wheels but tubeless spoke wheels are an expensive addition to a motorcycle. That said, the nature of the engine is the same as the 310 R. That means a sweet cruise between 80 to 110kmph. You can get up to 120kmph also but your right foot will feel a new buzz starting up in the footpegs. It is 6,500rpm for 100kmph, for your reference. And at that pace, the GS engine is barely audible and your sense is of composure and the feeling of a lope rather than a run. Lovely, really. That said, I'd have preferred this feel all the way from 80 to 130kmph but that needs at least 10PS or more to be available. The GS handles well. It turns slower than the R but it feels stable and confident. The Tourance tyres have a profile that tapers sharply and you will feel initially like it's almost falling to lean, going away from vertical a little too rapidly. But you do get used to it. And the sharp profile also combines well with the wide bars and tall seating to give you what I suspect will be an extremely adept commuting tool. The taller suspension does give the GS a softer ride than the R. Your first sense is of a tall and stiff motorcycle. But you quickly learn that while the GS feels reactive over small, sharp bumps, it is able to handle bigger bumps and undulations with great composure. It's a good compromise for a motorcycle that is expected to find itself on unusual roads and in places where there aren't any. Now many of you keep asking if the G 310 GS is an off-roader. Let's be clear, it isn't. It's a dualsport. The 19-17 inch tyre size combination endows the GS with good highway manners and pleasingly tactile and responsive off-road manners. Standing on the pegs and riding an off-road trail, the GS rapidly gave me the confidence to open throttle in more places than I normally might. The Tourances hook up and drive and the 19in front reduces the deflections when you hit rocks or ruts. I do think that if you're going to do a lot of off-roading, you will probably want to add risers and raise the bars higher for a more natural riding position when standing on the footpegs. 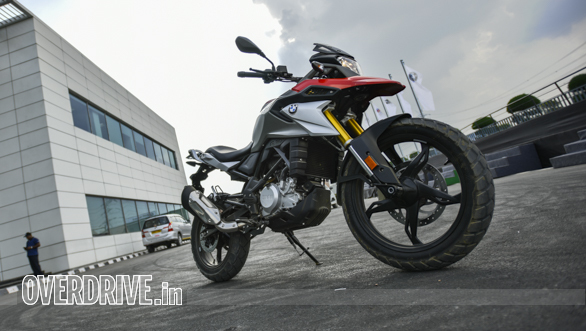 At Rs 3.49 lakh ex-showroom, the BMW G 310 GS isn't cheap. But I believe that it will find many homes. Because the quality of the product is obvious. And because no matter how hard I pushed its buttons, it didn't seem to suffer in the slightest. In that sense it feels solidly made and built to take a bit of a bashing in its stride. It also feels like one densely packed unit rather than a motorcycle composed of many small aggregates - it's a feel that I love. It feels like it will last, it will tour, it will make you happy in the long run. And if you think about it, that's what the bigger GS is known for as well. So expensive? Yes. Unjustifiably so? Only on the social media and forums - I think the G 310 GS owners will be happy.